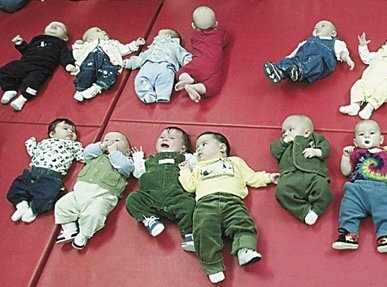 Police are asking the public for help in identifying a dozen mystery babies that were abandoned at an outdoor psytrance party. “We have no idea where these children came from,” says Sgt. Morgan of the Montreal police force. “What we do know is that ravers discovered the babies early Sunday morning around the time that their illegal party was wrapping up. One of the party goers noticed several burlap sacks placed near the entrance of the party. Upon investigating the bags, they realized they were full of crying babies. The sacks themselves had the words ‘Raver Babies Forever’ written on them. At the moment, that’s all we have to go on." The ravers at the party are equally baffled. “No one has reported the babies missing,” says party promoter Gregg Hugbawks, “so it’s not like they’ve been kidnapped. Is there some kind of twisted baby making factory out there somewhere? And if so, why would the people behind the factory just drop off a dozen babies at a psytrance party? None of it makes sense." Police agree. “It doesn’t make sense, and we hope to crack the mystery,” says Sgt. Morgan, "Right now, we are deeply concerned about the circumstances surrounding these babies. Our first priority is to reunite these children with their mothers, which is why we’re requesting that anyone who has any information about them please get in touch with us immediately. We can’t do this without the public’s help. The sooner we can find the mothers, the sooner we can ensure their safety." Ravers, for their part, are worried about what the future holds. “There’s something creepy going on,” says Gregg, “and for one reason or another, whoever’s behind the abandoned baby incident has decided to make ravers a part of their sick, twisted game. Babies aren’t toys. They’re tiny human beings! I hope they catch the person behind this. Otherwise, who knows what we’ll discover at our next rave."